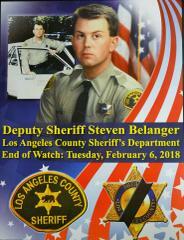 A new portrait of fallen deputy, Steven Belanger, was unveiled Wednesday morning February 6, 2019, exactly one year to the day of his passing. The memorial hallway at Walnut/Diamond Bar Sheriff’s Station, in which it hangs with a plaque, was recently renovated. It is a hallowed place honoring local law enforcement officers who made the ultimate sacrifice, just as Deputy Steven Belanger did. He was the first deputy at that station to lose his life in the line of duty and the memorial wall was dedicated to him. In March, 1988, Steve took a solemn oath of office to faithfully discharge his duties. 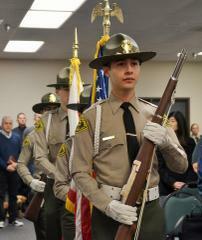 He was a second-generation Los Angeles County deputy sheriff who followed in his father’s footsteps. It was less than ten years later, while assigned to Walnut/Diamond Bar Station, Steve was critically injured by a suspect. 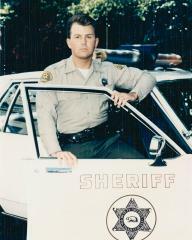 During a vehicle stop on Saturday, December 10, 1994, in Rowland Heights, Steve was shot by a suspect. He was struck in the head, with the bullet permanently lodging in his brain. He survived, but his life, quality of life, career, and family were changed forever. On Tuesday, February 6, 2018, Deputy Steven Belanger succumbed to his injuries. In a ceremony before the unveiling, Captain Al Reyes spoke about Steve’s bravery and fighting spirit. He pushed through the physical challenges caused by the shooting and survived for more than 23 years afterward. Steve, as do all who sign up to be in the law enforcement business, knew the dangerous possibilities and chose that path, anyway. "It's a job you choose based on the concept that you can make the world a better place," said Captain Reyes. Steve’s patrol training officer, Deputy Dan Duran, recalled a funny moment they shared, and spoke affectionately of Steve’s perennial smile, humor and professionalism. They spent time a good deal of time together while Steve was on training and became so close, he considered Steve as one of his sons in law enforcement. "Sometimes you question God on why things happen," said Deputy Duran. "But just for me, I want to thank God that I was part of his life. There’s always going to be a smile on my face when I think about him," he said. Steve’s wife, Chris, and daughter, Nicole, attended the event with other family members. The room for the ceremony was filled with longtime friends, and former coworkers and supervisors, gathered to honor an esteemed partner. It was not even 25 years earlier that Steve walked the very hallway dedicated to him today. Newer generations of deputies who pass through the same hallway also attended the event and could see how much Steve meant. By walking through the memorial hallway, past Steve’s portrait, they will be able to see his sacrifice in service and know how much he gave to make a community safer. The renovation was generously funded by the Association for Los Angeles Deputy Sheriffs (ALADS); Professional Peace Officers Association (PPOA); the office of Los Angeles County Supervisor Janice Hahn, 4th District; Rotary Club of Walnut Valley; and station fundraising events.